Surely I am a Muslim and we don’t believe in re-incarnation (except for Jesus Christ but then we believe he never died, God saved him on the cross) so title might be a bit confusing. Let me quote Jasim-ud-din, "ghumiye achhe shishur pita sab shishur-i antore" (Every kid has his father sleeping inside him). Get the sense? Yes, I am a father of the best baby in the world. My father is very fond of story telling. And he excels at it too, unlike me who can bore people to sleep when telling a story. And one of the stories my father fondly tells everyone is how I was a surprisingly brilliant kid in my childhood. Leaving other stories for the time being, which you will find difficult to believe anyway given my enmity with IQ nowadays, let me tell you one which I like. There is this book I received as a gift, even before I could read the alphabet. 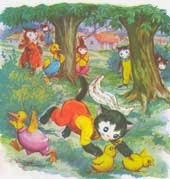 Its one of those books where each page has 4-5 lines and remaining are illustrations. 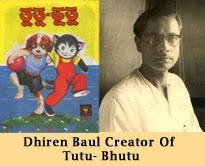 The name of the book was "Tutu Bhutu", Tutu and Bhutu, a dog and a cat respectively, were the two main characters of that book. Here is the only cover page which I could find on the internet. Pardon the image size. Forget the story of it, in gist the story was how Bhutu went fishing and had a feast with all his friends with the big fish he caught, let me get to the story my father would love to tell you a thousand times. According to him, they read to me the book and I just loved it. The love went so crazy, that I will go around the house to find anyone free and give him the book and ask him or her to read it to me. I will sleep with the book beside myself and in a day, I would make them read the same book at least 20 times. I would even insist that they should laugh when I am laughing. Now is the incredible part...I heard the book so many times that I memorised the book completely without knowing how to read. So, I can recite it from my memory, even pause at the punctuations and turn pages at the appropriates breaks. So, if you don’t know the story behind, you will feel a tiny kid is reading it fluently. The second page of the book. The childhood copy was of course soiled from so much of use and while my sister was growing up, she made sure its completely torn. Sadly, this classic, which could have taken any child classic including those from Lewis Carol, never received the publicity or popularity it deserved. I finally got a copy few years back at the bookfair when I was doing engineering and had to literally beg to the publisher to sell me the copy which was there for illustration purpose alone. Coming back to the purpose of this blog, I always wished I could see those days. I never could. But now I know there is a strong chance. God has given me a great baby and hopefully he will soon be with me and I can't wait to see tiny Faiz running around with his copy of Tutu Vutu and asking all to read the same to him multiple times a day. Time to re-live is probably so close.